I'm furiously knitting on many projects and so far I'm enjoying each of them immensely. 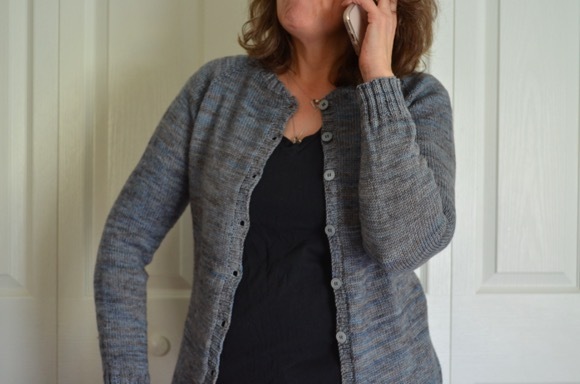 This knit is the Nae Shawl and is wonderful to work on. The pattern is side to side construction and the yarn has a bit of bamboo, so the texture is kind of slinky, kind of crunchy and overall soft. The project is a decadent tactile experience! My sock progress is coming along, I finished the gusset of the second sock and I'm sure that I will be done very soon. Oh and in yesterday's post I announced that I am foolishly going to knit a sweater by Thanksgiving. I've cast on and working my way to the sleeve division (top down construction of course). My reading....sigh, it's been the same again. I'm thoroughly enjoying Secret Keeper by Kate Morton and it's a long book! Since I'm knitting so much during the day while my fingers hold out, my reading time is limited to the evenings and as you know I tend to fall asleep. I believe I will finish this book this week. I hope so at least. The book is set during present day and WW II, switching back and forth developing two plot lines at the same time and uncovering a mystery. Ann Lamott's book is still gracing my side table of the bed as well for a bit of laughter and spiritual inspiration. I love Anat's designs and have SimpleLines in travel bag for trips in the car. I am really drawn to the yarns you are using Karen, very in with the season and oh so pretty. Your Nae is going to be stunning. I just put The Forgotten Garden by Kate Morton on my ipod for when I exercise, I love a good long book. Right now I am listening to The Kitchen House and really enjoying it. I have no doubt you will be sporting that beautiful sweater on Thanksgiving day! One of my friends has made two of that pattern and she LOVES it! I know you will be beautiful wearing that gorgeous autumn shade! sounds like all is well at your house....lots to knit, lots to read.....and loving it all!!!! (sounds a lot like my house, too!!!) Happy over the hump day!!! Aaaaah! Sounds like me at the moment Karen - lots of things on the go. Your pumpkin is lovely and your new shawl is beautiful. I love the colors that you choose. Where do you buy all your beautiful yarn? 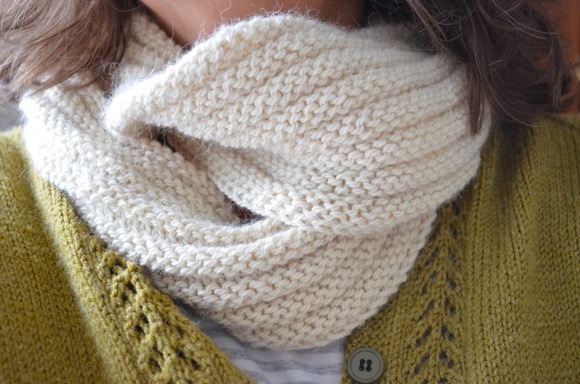 Every single project you knit makes me drool over the gorgeous yarn! The yarn for your shawl is yummy! I love the colors and texture. I am so excited to see your sweater, that yarn is just gorgeous! I've just started Snow Child and I can already see that I am going to be finding time to sneak away during the day to read it! I also am completely in love with The Kinfolk Table, half storytelling half cookbook. I just started a sweater as well......hoping to be done for the Holiday too!!! Love the yarn for your latest shawl! you always find the greatest patterns and then I have to add another to my fav list!!!! Enjoy your fall knitting!!! I have decided that I want to get all my Christmas knitting done by November 30th. Probably a tall order since that includes a sweater, some slippers and a couple pairs of socks. You will get your sweater done - no worries! I love the way you describe the yarn- decadent tactile experience indeed! How are you liking the side-to-side construction? Love your pumpkin. I must go and buy ours. Good luck with the jumper knitting it will be lovely to have something new to wear for the holiday. I hope I get mine done for Christmas. What a great look your Nae is taking on! I had hoped to finish mine by now but got waylaid by socks. I love the yarn you are knitting. It makes you warm just looking at it. I have The Forgotten Garden by Kate Morton waiting to be read. I have yet to read one of her books. what pretty autumny colors karen, the shawl sounds dreamy! I"m not sure how you finish all of your projects as soon as you do given how many projects you have going! I do love the colors you pick for your projects though. 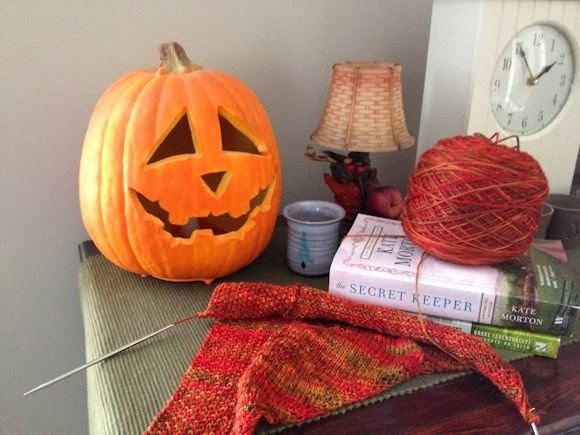 Your picture just made me smile :) Love the yarn and that pumpkin. I'm reading a long book, too, and really liking the experience of staying with one story for more than just a week. I feel like it has allowed me to really sink into the characters and place. love that red yarn and love your pumpkin! You are sure one productive knitter! Love the scarf! Thank you for sharing. I am not a great reader of fiction, but I find Kate Moreton strangely compulsive! I hope you enjoy the book. p.s. have downloaded the shawl pattern too! That yarn is beautiful! Wish I could knit but just can't pull myself away from sewing long enough to learn! I got The Secret Keeper from the library because I remembered you talking about it. Love the autumnal colours in your photo! This yarn is gorgeous!! You said it has a bit of bamboo, and i have to ask although I probably sound stupid asking, does it really have bamboo in it?? The pumpkin has captured my eye..who does the carving? quite intricate work on the mouth. Wondering if you have also started on the other orange project?? You are a quick knit I must say- that would take me half a year and you do it in one night. You must spend a fortune on wool karen! I think you would love bamboo for it's lightweight breathable quality where you live. I hope you get your hands on some, I'd recommend a blend because 100% bamboo is drapey and has NO memory or shape. I've read The forgotten garden by this author and liked it very much so I will have to look for this one. Great color of your new shawl.